Imagine yourself climbing a hill. A steep hill. At the top of the hill is everything you’ve ever wanted—happy and loving relationships, a sense of peace and well being, time to enjoy the things you truly love to do, an organized home that nurtures and recharges you. Now, imagine that this hill is made of glass. And you’re wearing socks. And cotton gloves. Everything you want is in sight and sometimes, when you try really hard, it’s even within your reach. And yet, you never make it to the top of the hill, constantly sliding back down the slippery slope. Whew. Frustrating isn’t it? And if you’re like so many, getting organized can feel this way. You just about make it to the top of the hill when, whoosh! back to the bottom you slide. So let’s get that thought out of your head and imagine there’s a rope hanging from the top of the hill—someone has thrown you a life line. You grab the rope, pull yourself up, and climb Mt. Organization once and for all! Now imagine yourself at the top of the hill enjoying life, your home organized, your heart filled with contentment and joy. Ah, that’s better. Luckily for you there is no hill of glass that you must climb in your socks to create the organized and happy life you crave. But there are organizational slippery slopes, and if you’re not careful, the habits that create these slippery slopes will move you away from your organizing goals, much like a hill of glass. But not to worry, slippery slopes can be avoided. Here’s how. Understand what a slippery slope is. This is a particularly tricky slippery slope because it seems like such a good idea. Many of us have been programmed from an early age to do things perfectly. “Practice makes perfect!” And “if you’re going to do something, do it right,” has been uttered by many a well meaning parent. And it doesn’t stop there. All around us are images of perfection. Magazines are loaded with pictures of perfectly organized spaces, like closets, where not only is every garment precisely spaced and hanging on wooden hangers, but all the clothing in the closet matches! Beautiful? Sure. Attainable? Not for most. And if so, at what cost? Striving for perfection is also tricky because it spawns other organizational slippery slopes, things like procrastinating on important tasks because you’re afraid they won’t get done well enough, to not handling your filing or bill paying (at all) until you can develop the perfect system. If you have even one plastic bag or cardboard box stuffed with dissimilar items from a past de-cluttering binge, guess what? You’re on a slippery slope. Here’s why. It’s likely you stashed these items in the bag or box with good intentions of getting to it later. Right? Well, that’s where things start to get slippery. If you can’t answer specifically when you’ll be dealing with the items in the box, you’re on a slippery slope. If you weren’t motivated to handle the items in the box when you had a concrete deadline (people coming to your home) will you be more likely to deal with these items after they’ve aged for a few days, weeks or months? I’ve seen enough dusty bags and boxes filled to the brim in the spirit of de-cluttering to know the answer is no. To get on solid ground, de-clutter when you de-clutter. Stuffing items into a box is camouflaging your clutter…not truly de-cluttering. Instead of using a box as temporary storage, grab a box and use it to transport items back to where they really belong. Deal with the two minute to-do’s. Schedule any to-do’s that will take longer than two minutes in your planner or task management system. Decide to decide…if you aren’t going to use the craft store, pizza place or linen superstore coupon in the next week, throw it away! In short, de-clutter now instead stuffing it in a box and saving it for later. Storing items on the floor. Storing items on the floor is a slippery slope because floors are big! There is no limit to this strategy aside from the four walls of the room whose floor has fallen victim to this strategy. So what starts out as a small pile in the corner can easily (and in very little time) creep into a mound of stuff that covers the entire floor. To get back on solid ground, set storage limits. Store items on shelves or in cabinets or in your closets—where they can live comfortably and safely. Shelves, cabinets and closets have built in limits. Only so much fits! When these storage areas get too full, you’ll be prompted to take action and create space by letting go of some belongings. Remember, if you’re putting something on the floor, how important can it really be to you? Using flat surfaces to form piles. This is especially slippery when you’re using the pile to remind you to do something. Using flat surfaces to pile things like mail, invitations, sports schedules, forms to return to school, and project materials is very much like storing things on the floor. It’s a slippery slope because there are plenty of flat surfaces in your home. There aren’t clear limits. Establish a limit by adding an in-box or basket to corral your items. Then, empty the in-box regularly, preferably on a daily basis. 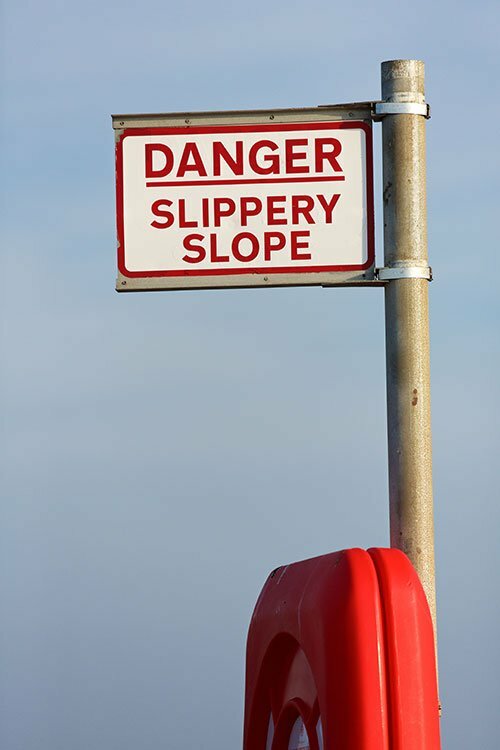 Dealing with things as soon as they come into your home will avoid creating a slippery slope! Regardless of where you are on the slope, it is possible to climb back up and conquer the hill. Here’s how. Recognize the habits that aren’t serving you. Here’s how you can tell if a habit isn’t serving you: it makes you feel bad. You feel stress over the stuff in the box. You’re anxious about the cluttered floor, counter top or table. You’d rather have a tooth pulled, than let someone see “the room”. Once you are aware of the habits that aren’t serving you, take action. Go through those boxes and put away, throw away or donate the items you no longer need. Create space if you need it by getting rid of things that no longer fit—your home or your life. Get started on that project you’ve been stalling on out of the temptation to do it perfectly. Commit to doing it done. You can do this! And you’ll be so glad you did! Commit to a new habit. Once you’ve cleared out and overcome perfection inertia, replace your slippery slope habits with new ones that keep you on solid ground. If you recognize that you’re engaging in some non-productive slippery slope habits, and yet, the thought of digging out is overwhelming, get some help. Call on your spouse, a close friend, or one of my online classes. Sometimes it’s as simple as talking the project through with someone so you can build a plan and structure around your organizing goals. Don’t spend another day struggling to get up that slippery slope! Remember, the best way to avoid slipping over the edge is to never get near it. Stop striving for perfection. Quit de-cluttering by temporarily storing items in boxes or bags you’ll get to “someday.” Make a pact now to stop using flat surfaces like floors or countertops for storage. Set limits, create new, healthy habits and in to time you’ll find yourself standing firmly (and happily) on solid ground. How about you? Do you find your organizing efforts sometimes slip backwards? What habit(s) do you think are causing this? Please share in the comments below. I’m going to look for the Nike sign that says, “JUST DO IT” and see if that will keep me focused on what needs to be done (any particular day) and to keep me motivated to take action. Love the idea of finding a Just Do It sign! Thanks for this post. It’s quite helpful! Thank you – glad to hear it! Not doing a job because I don’t have time to do it “perfect”–guilty! Are you following me around inside my house? Thanks for the post–it helps remind me of progress not perfection, and good habits to keep going. Will do Lill! Glad the tips are helping. I think I’m guilty of all of them at one time or another! Ouch! At least I did make PROGRESS so we could shampoo the carpets! Hopefully, I won’t lose momentum. Carla, I hope you celebrate your progress & continue. Even a commitment of 15 minutes a day could make a huge difference. Congrats on being able to get the carpet cleaned! That’s fantastic!! Keep taking steps forward and you’ll get where you want to be. Another excellent article. Thanks, Aby. Your encouragement helps me to keep at it. Using flat surfaces to form piles–that’s me! I call this my Pilot (pile-it) Project. Often too ill to deal with papers or unable to decide what to do with them, I’m now slowly beginning to get organized. I created a project/to do list + a box of temporary files to sort loose papers + permanent files. Mail is handled immediately. As soon as I’m well enough to go out, I will order a filing cabinet, so I can put all my files in one place. When the paper clutter is sorted, I will file or add to my to do list. Tweaking my new systems was time-consuming, but well worthwhile. Hope you are feeling better soon Louise! This article really hit home!! Have you been looking in my windows?! I am a flat surface piler! Paperwork is my nemesis! I have been working on clearing it up! I also have piles of projects to do. I also have bags/boxes of quick clean up items! I am also a sentimentalist and have things that were my mothers, grandmothers, and great grandmothers that I cannot seem to get rid of! In other words I am in desperate need of help! I wish I could get on clean sweep! I am also a perfectionist! I was raised on the “if you are going to do it, to do it right” mantra! Therefore I procrastinate because I feel like I do not have time to do it right! I am going to try the “do it until it gets done” mantra!